Have you ever wondered what it means when you hear someone refer to the “Path of Yoga”? The practice/path of yoga is an art and science dedicated to creating union between body, mind, and spirit. Its objective is to assist the practitioner in using the breath and body to cultivate an awareness of ourselves as human beings intimately connected to the unified whole of creation. Most of us enter yoga classes eager to learn the “asanas,” the third limb of yoga. There is absolutely nothing wrong with wanting to practice the third limb of yoga — it’s what draws most of us in! However, when you begin to examine the other seven limbs and actually commit to the eight-limbed path as a guidance system, that’s when the magic happens, a sweet clarity. The eight-limbed path, the core of Patanjali’s Yoga Sutras, forms the structural framework for yoga practice. When you practice all eight limbs of the path, it becomes self-evident that no one element is more important than the other. Each is part of a holistic focus that eventually brings completeness to the individual as he or she finds connectivity to the divine. Because we are all unique individuals, everyone moves along this path at their own pace. 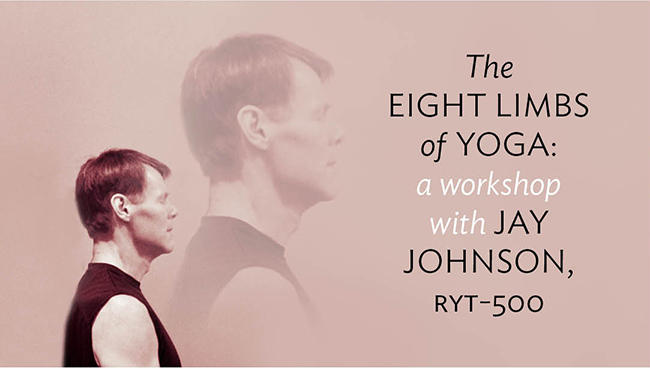 Jay Johnson, a dedicated yoga teacher and practitioner, RYT-500, registered through Yoga Alliance, has an amazing way of conveying this ancient path, the Eight Limbs of Yoga. Come and experience a simple conveyance of what some consider a complicated path. You will walk away with a greater understanding of the practice of yoga, and you will feel great for having given yourself this gift.